Another invisible alleged perpetrator, this one on MyGC. 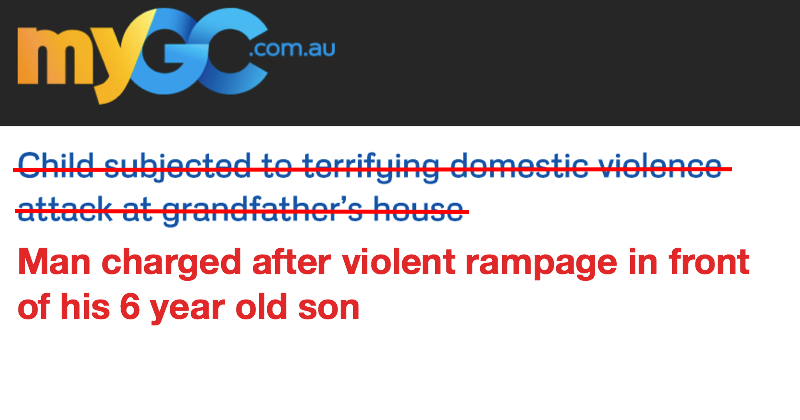 A 41 year old man was charged with weapons offences, breaching an AVO and assault police after he went on a violent rampage in his fathers house while his 6 year old son was present. According to the report police were so concerned about firearms in the house they had to withdraw and set up a perimeter around the house while the little boy was still inside. Despite the seriousness of the charges, the alleged perpetrator doesn’t make an appearance in the headlines. Not only does it make him invisible, it implies the grandfather was the perpetrator rather than another victim. It starts with a very basic English sentence: “John beat Mary.” That’s a good English sentence. John is the subject, beat is the verb, Mary is the object, good sentence. Now we’re going to move to the second sentence, which says the same thing in the passive voice. “Mary was beaten by John.” And now a whole lot has happened in one sentence. We’ve gone from “John beat Mary” to “Mary was beaten by John.” We’ve shifted our focus in one sentence from John to Mary, and you can see John is very close to the end of the sentence, well, close to dropping off the map of our psychic plain. The third sentence, John is dropped, and we have, “Mary was beaten,” and now it’s all about Mary. We’re not even thinking about John, it’s totally focused on Mary. Over the past generation, the term we’ve used synonymous with “beaten” is “battered,” so we have “Mary was battered.” And the final sentence in this sequence, flowing from the others, is, “Mary is a battered woman.” So now Mary’s very identity — Mary is a battered woman — is what was done to her by John in the first instance. But we’ve demonstrated that John has long ago left the conversation.